In our ever continuing quest to improve clutching and the life of our belts we are constantly doing testing and for me unfortunately it has to be done on the weekends when the phone is not ringing. Before I get to the lower belt temp deal, please understand a belt is a "consumable" no belt by anyone lasts forever, if that was true and the OEM was so dang good then why are there so many companies in the belt business and why are we selling so many? Stuff happens, some you can control and some you can't, just part of this. We go by pure numbers, as long as failures of any kind belts fault or not stays around 1% we are good. Anyway back on track, while doing some belt testing I ran across an issue that I am sure most all of our vehicles have but this one in question is a 2018 XP 1000 Two seater and I tried two different secondary clutches and three different belts including the OE, our std and our Thick belt. First thing I did was check alignment with my clutches on this vehicle, I was not having any symptoms that I knew of just wanted to check it. I found the two shafts were about 1/16" too close together and my alignment was off only by a shade. So I used the SDI alignment tool and aligned them. Keep in mind on this part, it was just barely out. But that 1/16" of an inch too close together can be the difference in my belt hitting the top cover and it not in the right set of circumstances. 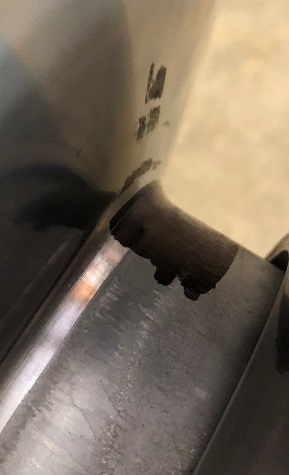 Ok so it is aligned and now as part of belt testing I do, I am randomly checking batches for fitment and this time I used a black marker to mark the sheave face on the secondary clutch to see how the belt travels and to what extent. So enter in picture one below. Notice how the back sheave has a curve to it and outside one is made a bit different. If you look close you will see the marker rubbed off this angled part. Keep in mind this is a stock clutch and the belt pic to follow is a stock OE belt. You can see in this pic the belt at top speed is coming down into the curved part of the clutch. Here is a pic of the belt. Notice how the side that corresponds to that side of the secondary is worn more than the other side and this belt has less than probably 50 miles on it, as mentioned it is the OE I had on it when I bought it before switching to ours. It is obvious that the belt is traveling too far down and touching it. How do we fix it? Make the belt longer so it does not travel there? Can't do that as it would be easier to hit the top cover on decel when the belt goes slack. So what I did was install a new items at Hunterworks, a White washer that is twice as thick as the stock Blue Washer. We were adding a second blue washer but they are hard to get in bulk and deform over time. Our new White washer is more durable and readily available since we have them custom made. 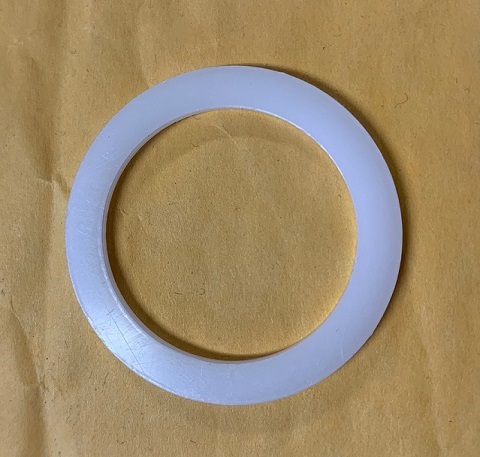 You remove your one blue stock washer and add our White Washer in the primary clutch. So what this does is limit the travel of the primary clutch which in turn limits the travel of the belt in the secondary clutch. Below is what the marking looked like after. Now the belt stays on the flat part of the secondary clutch and all it took was just a tiny bit of me limiting the travel of the primary clutch. As far as the temps go, before I did this at top speeds my temps were steadily climbing and if I had not let off it would have continued to climb and I have seen temps as high as 235 on my Razorback gauge and now I let out around 85 mph and my temps only topped at 201 degrees so it is a huge drop and it was not climbing either. Keep in mind I let out, those who are traveling at speeds at 55 mph or so on up will or can see temps continue to climb. The belt fully shifts out around 55 or so, it will be in this area then. At higher speeds the primary pulls even harder against this area and makes the temps even higher. If you continue the belts temps will continue to increase to the point the belt will come apart. Does the spacer actually limit my speed? No, I have a programmer and I let out at 8700 rpm because I know belts don't like to go past that RPM and I was around 85 mph. Without a programmer the vehicle has a speed limiter that is set at 78-80 before the ECU closes the throttle holding you there, I am still under the 8700 RPM threshold so it should not affect your top speed without a programmer either. To install, I simply take the main bolt holding primary out, remove the six screws on the clutch cover, remove cover and spring and slide the new spacer on the center shaft right on top of the other one that is there now and then reverse it, easy as pie. This is also a reason you see inside teeth on belts coming out, from too much travel. Updated Info: This info was added after the original article was written. All this info seems to affect the 14-15 models XP 1000 as well. We have two customers I was checking in with that was having blown belts at high speed. One is a desert racer and the other just a fast or high speed rider, both had 14 models and both only had one blue washer and the parts diagram for a 14 calls for two. To my knowledge the 14 is the only one Polaris is putting two in but both of these only had one of the washers mentioned below. I had both of them check their belt travel with markers and both were hitting the radius. Also this could affect low range too if you are running faster in low, if you think you are near full shift out of the clutch in low and that would rpm and I am guessing around 7000 or so then the belt will be down in this area too in low range as well. Then one more piece of new information. I am almost embarrassed to tell this because I should have known. 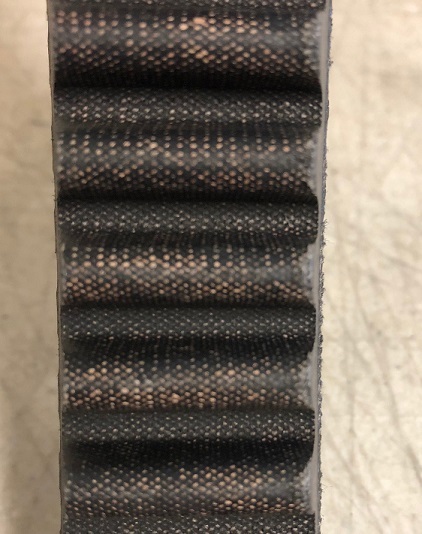 We have been selling gates belts for several years before we started making ours, in recent belt testing for something different I found out the Gates 27C4159 belt is actually too short by roughly 1/8" and it making this problem mentioned here even worse and has the teeth hitting the center flat area shown above in the pics and ripping inside cogs off at times. Keep in mind all of this even the gates belt deal is not normally going to affect people who do not run at full shift out or at or near top speed long. 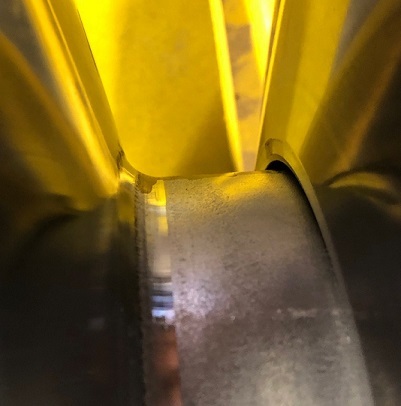 And oddly enough, if your shaft spacing is off and your primary and secondary shafts are too close together, all of the above might not as big of an issue as when it is right, however when too close you can have belt slack on decel and the belt hit the cover. This applies to people in low range too that run high rpm, any time the belt gets full travel this can happen just the same as if you was in high gear running top speed. These pictures were done in neutral to show the belt travel. So no load is required, just high rpm and full belt travel. The heat comes in with the added load.